THOMSON, IL (Gray News) – It’s not just the human world where the definition of a family is expanding. A trio of bald eagles is raising three eaglets together at the Upper Mississippi River National Wildlife and Fish Refuge in northwestern Illinois. It’s located about 140 miles west of Chicago, along the Mississippi River. 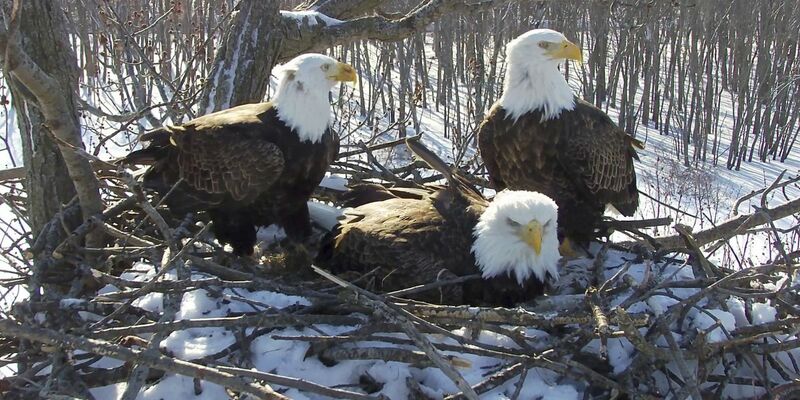 The two males and one female have become an internet sensation thanks to a webcam set up by the Stewards of the Upper Mississippi River Refuge that keeps tabs on their nest. The males are called Valor I and Valor II. The female is known as Starr. “Fans from all over the world have been watching this nontraditional family through a webcam as the eagles deal with the trials and tribulations of parenting,” the U.S. Fish & Wildlife Service website said. Typically, a male and female eagle mate for life. The National Audubon Society says it’s rare to have three eagles sharing a nest. Males tend to be territorial. The society added what’s even more remarkable in this case is that the two males stayed together and courted a new female after their first mate died. “We feel like it’s a pretty special nest and hope it stays here for a long time,” Robyn Bailey, NestWatch Project Leader at Cornell University’s Lab of Ornithology, said.